So, yeah, I like a full coverage base with lots of steps – as seen in this post here – but this week I have really embraced the minimal makeup routine. I know, am I feeling OK? No! My eye is basically broken, and after a night of putting in eye drops every hour on the hour I am feeling pretty tired and have no time for makeup. All I want is hot chocolate and naps. When I have been putting on makeup this week though, these are the three products. The holy trinity? Smearing the Laura Geller spackle primer all over my face means any base I do use stays put all day. 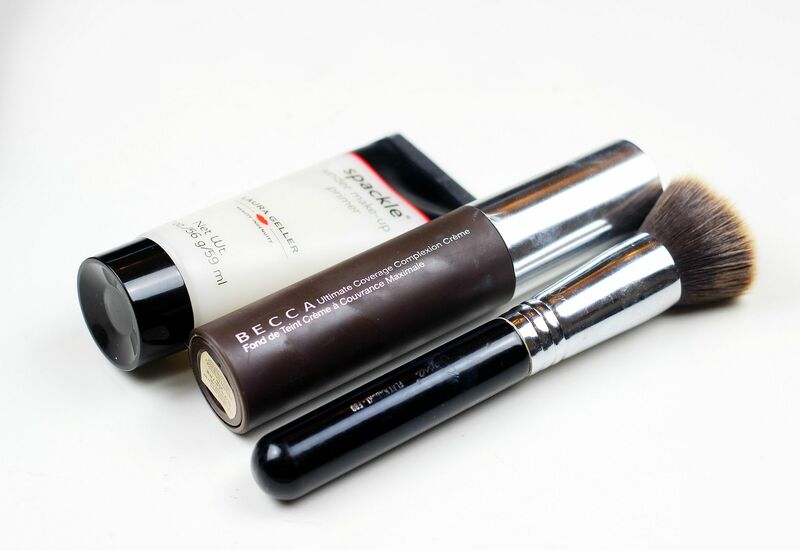 I know I always always always use an illuminating primer, but the BECCA ultimate coverage creme is one of the few foundations that actually gives the skin a genuine glow. It’s so thick and creamy, and blends into the skin really nicely, and it lasts on the skin without being set with a powder/spray. To blend it in, I use a buffing brush and the one that happened to be clean at the moment was the Sigma f80, which is a bit of a beast and blends everything in a matter of seconds. If you liked this post, you might like this post about 5 products for a flawless base or this post about my foundation cull. New in: Dior Glowing Garden collection.